The chimney at the top of the Hill dates from the 1790s and was built to serve a copper smelting works by the river; a duct ran up the side of the hill to the chimney. It was later used by a chemical works until falling out of use around the time of the First World War. The chimney is 15.92m or 52ft 3in tall. “I really used to enjoy the views from the top of Troopers Hill but always thought they would be even better if I could stand on top of the chimney". Olaf was talking about the tall stone Grade II listed chimney at the top of Troopers Hill. Although he has returned to Norway, he has kept abreast of local events in the Crews Hole area by following the Friends of Troopers Hill via their newsletter, website, Facebook and Twitter pages. His imagination was fired by the pictures of scaffolding around the chimney, erected while Bristol City Council was carrying out maintenance work in 2016. "I wondered whether it would be possible to build a spiral staircase around the outside of the chimney. I realised there could be quite an issue about the chimney's slight 5 degree lean and I definitely did not want people to be able to step from the staircase and fall down the middle of the chimney. There is a firm of architects in Bristol, P.D. Avril Associates who specialise in challenging structural engineering projects. I contacted them in March 2016".
" We were delighted to take up the challenge. 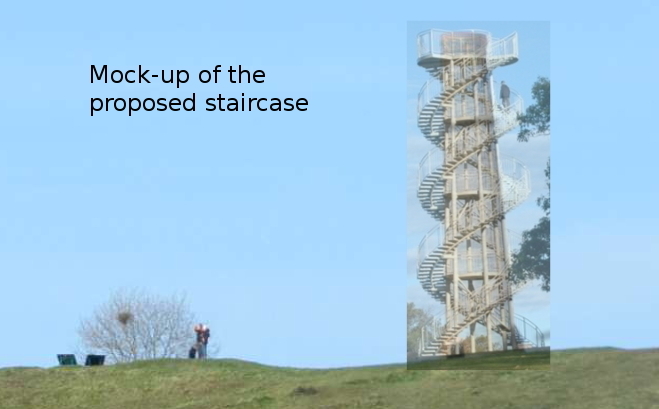 The Troopers Hill chimney is Bristol's very own leaning tower. We kept our proposals very close to our chest as we know they would be controversial. The project was called the "Pisa Project" through the planning stage. 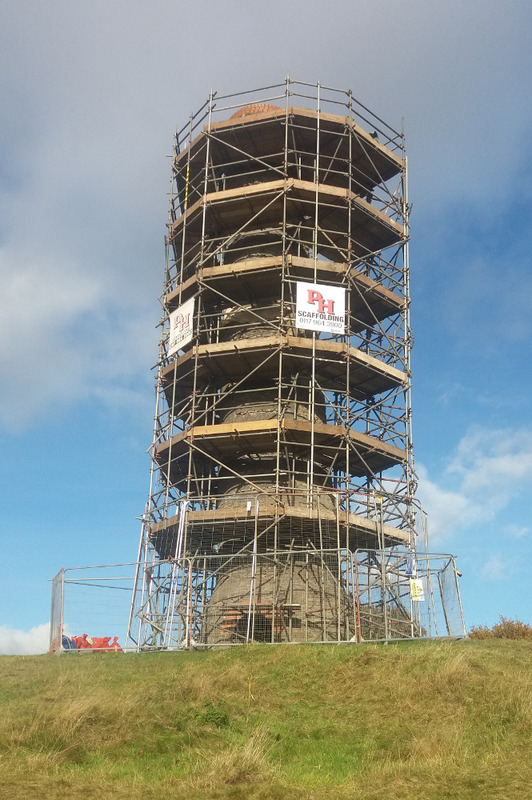 We are delighted to say that because this structure can be used for future maintenance and access to the chimney, it does not require planning permission; it fits in the same category as scaffolding." “In this time of major cuts, this could be a way of providing a self-funding tourist attraction while also allowing future maintenance to the chimney to be done without scaffolding or ropes. The proposal includes a turnstile access system where credit from your mobile phone can be used to pay your entry fee. All proceeds would go into a fund for future maintenance of both the upper and lower chimneys. We are awaiting feedback from the landowners, Bristol City Council, and English Heritage. Naturally everyone is very welcome to our next Friends of Troopers Hill meeting to discuss this further and to see the architectural drawings. " Susan went on to describe the staircase design which features a double spiral mimicking the structure of the DNA molecule. "This serves two purposes. It allows people to use the staircase continually without passing people walking in the opposite direction but it is also a reference to Troopers Hill's contribution to the DNA project carried out by London's Natural History Museum in 2015 for the rapid identification of bees. More than 75 bee species have been recorded on the site, which made it a natural choice for collecting bee specimens for this project. We were extremely pleased by the compliments about our conservation work made by David Notton, Senior Curator (Hymenoptera) when he visited Troopers Hill, collecting specimens." 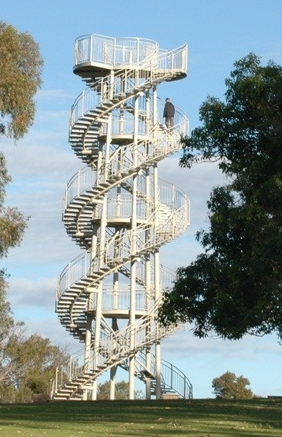 The idea of a DNA staircase is not new, Kings Park and Botanic Garden in Perth, Western Australia features a “DNA Tower Climb” but it will be a first for Bristol.